MIDLAND CARRIERS - Polyethylene Pipe Spool Trailers and Equipment. The Midland Carriers Model LF 660 Lay Flat hose retrieval and deployment system has been a very successfull addition to the Midland Carriers product line. 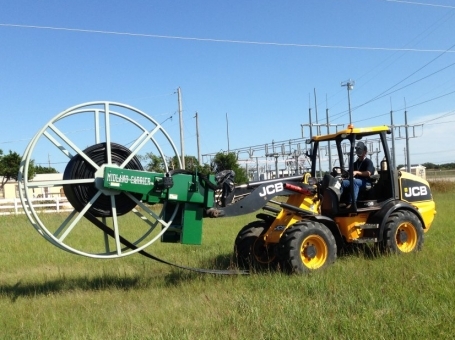 It is designed and manufactured to retrieve and deploy lay flat hose up to 12" diameter. Please click here to contact us for more information. Right: LF 660 deploying 660' of 12" lay flat hose.